Recently I was given the opportunity to preview an upcoming new game that is currently available to back on Kickstarter. I received a pre-production copy of the game and rules. These are my thoughts and opinions on the presented materials. Enjoy! 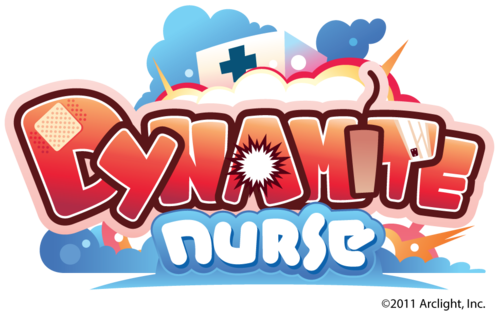 Dynamite Nurse is a game by Atsuo Yoshizawa, published by Japanime Games. It is for 3-5 players. In this game, players take on the role of doctors in a fantasy hospital. They will be trying to heal adventurers that have been poisoned, cursed, wounded or otherwise sickened during their adventures. Along the way, they’ll be recruiting nurses and trying to keep their patients from dying. Of course they’ll have to be careful as their opponents will try to sabotage them. If a doctor kills off too many patients, they’ll take on the title of Dynamite Nurse which will have many negative consequences involved with it. In the end, the player that can best transport and treat patients thereby earning the most victory points will be declared the winner. To begin, the cards are divided by type; patient, action, nurse, kill mark and dynamite nurse. The patient cards are shuffled together and place face up in the middle of the play area, known as the Town. Players can either choose or be given a starting nurse card with a red star on it beside the nurse’s name. The rest of the starting nurses are returned to the box. The remaining nurse cards are shuffled together and placed face down in the play area. The action cards are separated out into face up piles grouping the cards by color and name into the play area. Event cards are shuffled together and placed face up in the play area. The Kill Mark cards are placed in the play area in reverse numerical order with 15 being on top and 1 on the bottom. If only 3 players are playing, the first 3 cards; 15, 14 and 13 are removed. The play area should now look like the picture below. Players receive 6 duty markers that match the color of their starting nurse. They’re also given a starting deck consisting of 5 examination and 3 simple surgery cards. These 8 cards are shuffled together with their starting nurse to form their deck. Their deck is placed face down in front of them. Each player draws 4 cards from their deck to make their starting hand. The first player is chosen and play now begins. The game is played over a series of turns. Each player’s turn consists of 4 phases; main phase, transportation phase, admission phase and cleanup phase. The first phase is the main phase. In the main phase, the player will play as many cards as they want from their hand, one at a time. The cards are placed in front of the player in their Hospital area. Once a card is played, the instructions on the card are followed. For the starting cards, this mostly involves gaining gold or treatment points as a bonus. The player can then take 1 action; either make 1 purchase or treat 1 patient. The only way that a player may perform more actions is if they play a card that allows them to perform more actions, such as their starting nurse card. Gold and Treatment points can be used for different things. With the gold, they can buy new action cards from the Town by paying the amount of gold in the top right hand corner of the card. The newly bought card is then placed in their discard pile. They can also buy event cards from the event deck. To buy one of these cards, the player declares that they are purchasing an event card. They may either chose to buy the top event card by paying the gold cost or they can buy the card beneath it. To do this, the top card from the event card pile is then placed on the bottom of the event card deck. The player is then allowed to purchase the card on top of the event card deck if they have the gold to buy it with, and if they chose to. The player does not have to buy the card if they don’t wish to. However, this still counts as a purchase action regardless of whether the player buys the card or not. Treatment points are a bit different. With the treatment points they can treat patients either by operations or care. Operations are when the player pays the large severity icon’s value, located on the card, in treatment points which were gained from the cards they played earlier. This can be used to treat either normal or critical patients. When a patient is in critical condition, they will usually have a smaller severity icon value that may be paid in treatment points. When this is done, the patient card is flipped back over to the normal side. Before a patient may be healed, they must first be in the player’s hospital with a duty marker on it. Players are not allowed to heal another player’s patients with their duty markers on them. Once the patient is healed, the duty marker is removed and returned to the player’s supply and the patient is placed in their acquired patients stack. These cards will give the player victory points which are scored at the end of the game. When a player acquires a patient card from performing an operation, they are also granted a nurse card. The player selects a nurse card of their choice from the stack and places it into their discard pile. This brings us to the next phase, the transportation phase. In this phase, patients are transported and duties are assigned. Transporting a patient simply means taking a patient card from the top of the patient deck and putting them in the ambulance line. If there is already a patient in an ambulance, the new patient card is placed to the left of this card. The space farthest away from the deck is called the “leading patient”, while the closest is called the “trailing patient”. Once a patient has been transported, duty is assigned. The player selects any player’s duty marker, including their own and places it on top of the patient card. This signifies which player’s hospital the patient will be going to. However, there is a limit to the number of patient cards that can go into ambulances. That number is equal to the number of players. If the number of patients reaches the limit, then transportation doesn’t happen. Instead a patient enters critical condition. If the leading patient is not already in critical condition, then this card is flipped over to it’s critical condition side. Duty markers remain on the card. If this card is already critical, then the next card in line goes into critical condition instead. The next phase is the admission phase. 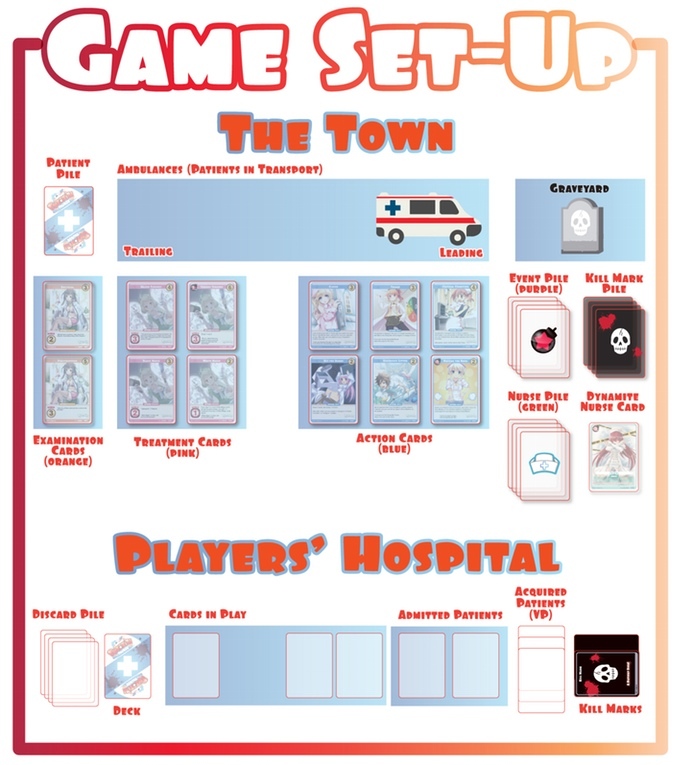 In this phase, the player selects one or more patient cards in an ambulance that has their duty marker on it and moves them to their hospital. The player is said to “admit” the patient when the patient card is moved to their hospital area. Each player’s hospital area has only room for 2 patients. If a player admits more patients than they have room for, then a number of patients equal to the overage go into critical condition. The player is allowed to choose which patients go into critical condition. However the same patient can not be affected more than once in this way. Speaking of critical condition patients, if a patient that is in critical condition has something happen to it that would make it go into critical condition again, the patient dies instead. When a patient dies, it is sent to the graveyard and the player’s duty marker is returned to them. That player then receives a Kill Mark card which is placed in their hospital. If the last Kill Mark card is taken, the game immediately ends. If a player ends up having more Kill Mark cards than any other player, that player receives the Dynamite Nurse card. The Dynamite Nurse is placed in the player’s hospital. This card will move around during the course of the game to the player with the most Kill Marks. The final phase is the cleanup phase. In this phase the player discards all the cards that they used during their turn, as well as any cards in their hand. However, the player is allowed to keep 1 card from their hand if they would like. Once a card is either kept or discarded with the rest of the cards, the player draws 4 new cards from their deck. Play then passes to the next player in turn order. The game continues with players taking turns, playing cards, transporting, admitting and healing patients. The game ends once one of these two conditions is met. If the Kill Mark card pile runs out of cards, the game ends. If the patient card deck runs out of cards, the game ends. Once the game ends, players add up their victory points. Victory points come from patient cards the player has acquired, patient cards admitted to their hospital, as well as for play and nurse cards owned by the player. The player must subtract points for Kill Mark cards and for having the Dynamite Nurse. The player with the most victory points at this time is the winner. I was told that the cards for this game were pretty much the same as the ones that will be in the production quality game. With that being said, I’ll say that the artwork on these is beautiful, especially if you like anime or manga. There’s nothing included that I could see that would be seen as vulgar or offensive. Some cards are a little over the top with the fan service but if you’re comfortable with anime or manga, then you’ll be fine with this too. I think the artwork fits the manga style theme quite well. The cards themselves are really good quality. I like the thickness and feel of them. The cards are easy to understand with very minor iconography on them, so there’s not a lot to have to try and remember. My copy did not come with the duty markers, so I can’t comment on them. I’m told that they will be made of cardboard and that there are also some thicker metal ones that can be added on to the kickstarter pledge for a small fee. In any case, I really like the overall look and feel of the game. I think fans will really enjoy these cards. The rulebook that I received for this game was printed out on copy paper. From the look of what I received, everything is well designed. There should be plenty of pictures and examples to help the player understand the game. Each of the card types is laid out and explained really well. The phases of the game are laid out really well so that it’s easy to understand how the game works. There’s also a glossary of game terms to help players more fully understand certain elements of the game. Also included is a fairly lengthy card faq section, which answers a lot of questions that may come up during game play. Overall, I saw nothing difficult or hard to understand. The rules look good and I’m sure the finished product will be even better. It’s been said many times that I’m a fan of deck building games. I love ’em and can’t get enough of ’em. This game takes an interesting spin on the deck building mechanic. Just like most deck building games you have your currency that you can buy new cards with, in this game it’s gold. However there’s also treatment points that allow the player to heal patients. This is where you’ll get a lot of your points from. You have to balance healing patients and buying cards to improve you deck. If you put to much emphasis on one over the other, you’ll wind up messing up both. I’ve also stated before that I love anime and manga so this is a game that’s right up my alley. Thematically the art style works with the feel of the game. In some ways the game feels like Dominion, in that you have a set group of cards that the player can choose to buy from. However the ever changing lineup which is present in the Cryptozoic deck builders and Ascension is also sort of present here in the form of the ambulances and patient cards. To me these deck building styles coalesce into a fully functioning game that is a lot of fun to play. I will say that I wish the game had a 2 player option as well. That would be the only gripe I think I could come up with, since the game only goes from 3-5. Maybe a variant is in order? In any event, it might look like the game is rather overwhelming to begin with, however it’s actually rather simple. Of course mastering the game takes lots of practice and experience. Fans of deck building games and/or anime and manga should really enjoy this one. I highly recommend it. It’s pure fun. 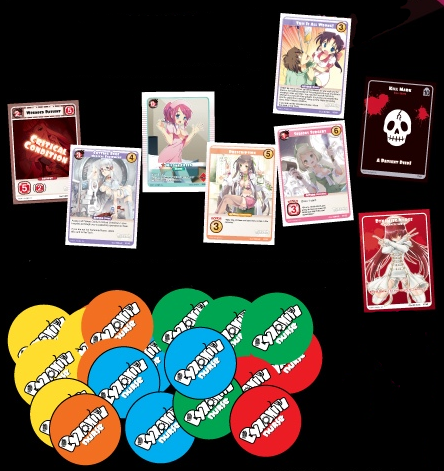 Dynamite Nurse is an anime and manga style deck building card game. The game doesn’t take too long. Most games sessions last about an hour. The game looks great. The cards are really well designed with some very amazing looking artwork. Anime and manga lovers will thoroughly enjoy the look. The game is fairly simple to play and puts a new twist on the deck building mechanic. I really enjoy playing this one. In many ways the game feels like a hybrid of Dominion and Ascension with a few minor changes. Fans of these 2 games should really enjoy this one as well, especially if they like the art style. Personally, I love it. It’s really well designed and loads of fun to play. I do wish there was a 2 player option, but even without it the game is still great. I can’t wait to see the finished product. I’m sure that it will be even better. I highly recommend backing this one on kickstarter or picking it up from your favorite game retailer. Either way, you won’t be disappointed in this game. No band-aids are required. You can also back it on Kickstarter right now by following the link below to the campaign page. This entry was posted in Preview Reviews and tagged atsuo, Atsuo Yoshizawa, board, board games, card, card games, dynamite, dynamite nurse, games, japanime, japanime games, nurse, yoshizawa. Bookmark the permalink.